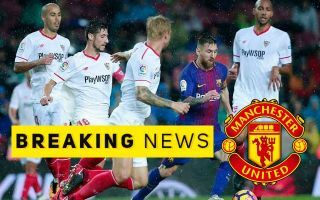 Manchester United are set to trigger the €18million release clause of in-form Sevilla midfielder Pablo Sarabia for what could be their first signing of the January transfer window. The 26-year-old has been something of a late bloomer, coming into his own in recent times in La Liga with eight goals and six assists from the middle of the park so far this season. Given his form and cheap price tag, United are planning to try their luck with an offer, CaughtOffside understands. This may, however, be hard to pull off as they would face competition from Real Madrid, according to Football Espana. Still, both clubs should now get the chance to negotiate a contract with Sarabia, and first-team football may well be easier for the player to come by if he chooses Old Trafford over the Bernabeu. The Spanish midfielder has previously had a spell in Real Madrid’s B team, so may well be keen to take up the opportunity to prove himself at the club again. United have been linked with other midfielders in recent times, and that could be a good option for them given some patchy form from the likes of Fred in recent times. Still, it also isn’t a position in urgent need of strengthening, certainly in comparison to the club’s options up front or at centre-back.